This is a white form of our native Maypop with pure white 'petals' topped by a corona of dark purple, lavender, and white producing an overall lavender effect. In all other regards this Passionvine appears to be identical to the native species, Passiflora incarnata. 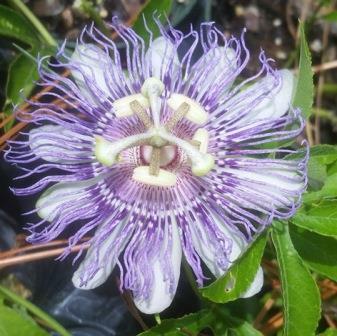 If you are looking to produce Maypop fruit be sure to have another pollen fertile Passiflora species on hand, like our seed grown Maypops, as Passionvines are generally self-sterile (vs. self-fertile) and so may not produce any fruit on their own.Pollinated flowers are followed by round passion fruit that ripen to yellow and contain a tangy tropical tasting clear flesh that surrounds each of the small black inedible seeds. This easy to grow perennial native vine can grow to 15-18' each year if given a suitable support but it is also happy to clamber along a fence, trellis, or any other support that it can grasp with its strong tendrils. Provide a well-drained soil and a full to mostly sunny position for the best results. The Maypop is the caterpillar host for the Gulf Fritillary and other members of the Longwing family as well as the Variegated Fritillary. The Maypop is the caterpillar host for the Gulf Fritillary and other members of the Longwing family as well as the Variegated Fritillary. This makes this a great plant for children to enjoy as the multitudes of often alien looking caterpillars are sure to pique their interest. One of the hardiest of passion vines the Maypop is native well into the central portion of the US reaching Illinois, Indiana, Ohio. The round fruit 'may pop' when you step on them giving this beautiful native passion flower its name. 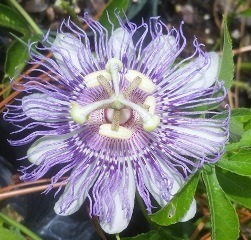 The Maypop is also known as: Purple Passionflower, Purple Passionvine, and Apricot Vine. Soil & Moisture: Average moist to somewhat dry soils. Flowering Period: Late spring to fall on established plants. These are the times of the year that you can expect this plant to be in flower. Most of the plants that we ship are already of flowering size and may even be in bud or flower when they are shipped but this cannot be guaranteed. 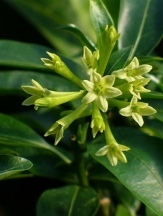 The length of time a plant is able to flower is often based on its size. The more mature or better established a plant is the more resources it has to be able to expend on flowering and fruiting. Some perennials, trees, shrubs, and most vines will need about 3 years of establishment to be large enough to begin to meet their true flowering and or fruiting potential. That does not necessarily mean that they will not flower in the interim but they may not be able to flower for as long a time span. The better the growing conditions like having ample available nutrients and moisture generally equates to quicker establishment and longer flowering periods. Fertilizing: Once growth commences in spring until midsummer. In general, plants will require the most nutrients when in active growth and less when dormant. For indoor plants and tropical plants grown in a warm greenhouse or atrium this may be year round. For winter growing perennials, like Louisiana Iris that go dormant in late summer, this may mean fertilizing in fall and winter. For spring and summer growing perennials, and practically all trees, shrubs, and perennial and woody vines in the garden we generally start fertilizing as early as 6 weeks prior to bud break (about Valentine's Day here in zone 8B in Louisiana) and they can be fertilized up to about 6 weeks prior to the earliest expected hard frost or freeze (about mid-August here in our gardens). This allows for tender new growth, and the entire plant really, to "harden off" prior to what could be potentially damaging temperatures and ultimately causing more harm than good. One of the most common questions that we get is what fertilizer do you recommend? Obviously it will depend on the particular plant but a good quality, slow-release, non-burning fertilizer is what we prefer. Each time it rains or each time you water your plants are getting fed. Most of these fertilizers are either slowly dissolved or osmotically passed through the outer layer of a pellet. We use Scott's Osmocote© 14-14-14 and 18-6-12 on 99% of the plants that we grow, it is more expensive than some fertilizers but we can depend on the results. DO NOT use common garden fertilizers (like 8-8-8,12-12-12) on acid loving plants as it may contain lime as a filler and so can be deadly to plants like Blueberries, Azaleas, and Camellias. When to Plant: After all danger of frost has passed and soil temperatures begin to warm in spring. 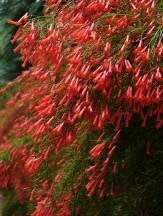 Preferred planting seasons ranging in order of the most optimum to least optimum times for ease of establishment. Container grown plants, like what we ship, can be successfully transplanted anytime of year as long as proper care is provided. This gives container grown plants an edge on bareroot plants. With that said, there are easier and harder times to establish some plants mainly due to the additional moisture required by the plant during the main growing seasons like spring and summer. If you keep that in mind there is no reason that the great majority of plants can't be added to the garden anytime of year. Deer Resistance: Moderate Deer resistance is relative to how hungry the deer (or other herbivores) are, what food is readily available in their natural habitat, and how tasty a particular plant is. 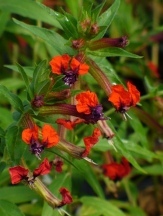 Few plants are truly completely 100% resistant to being browsed by hungry deer and other herbivores. Please realize that this is just a guide based on our experience and research but some plants may never ever be bothered. Please be advised that humans and/or animals may have allergic reactions if part(s) of this plant are consumed or by coming into contact with sap from bruised or broken plant parts: With the exception of the sweet and tangy tropical flavored ripe pulp surrounding the dark colored seeds, other plant parts may be toxic if ingested.